I thought I'd offer a quick review of "America's #1 dysfunctional family"'s first venture to the silver screen. For fans of the show who've been a little worried, let me just say this: this movie is like a long episode of The Simpsons. It's full of the usual witty political and religious comedy(commentary? ), has plenty of references to great episodes floating around(watch the background around Springfield Gorge), and even bags the mother of all Simpsons celebrity-guest voices: Tom Hanks! Above all this, though, the film really seems to capture the flavor of the TV series(starting its 19th season this fall), especially with their penchant for poking fun of themselves as a show and the TV industry in general. I could try to disect here all of the messages on religion that the flick is offering us, but that could get a bit dull, and frankly I'm never quite sure what Groening & co. are really trying to say about Christianity with their poignant-yet-thoughtful gabs. If the topic interests you, try Mark Pinsky's The Gospel According to The Simpsons, from what I've read of it, a fun little book from before the popular wave of 'gospel-according-to's(Superman, The Matrix, Narnia, the Smurfs, you name it...). Google Books also has some of the book online for preview. Instead, I'll close with this: if you're a fan of the TV show, then check out The Simpsons Movie. If you aren't, fair enough, but please don't overlook The Simpsons without giving them a shot. There's a reason this show has been on the air for nearly 20 years. Brant Hansen's blog. Take a look at these three posts of his, and tell me what you think. And yes, he does some more serious posting too(sort of), but I for one have always found sarcasm (in the case of one of those posts) an efficient way to communicate ideas. The comments are pretty great too. on the "new new atheists"
Here is an interesting little read from the Wall Street Journal's OpinionJournal on the "new new atheists"(i.e. Dawkins, Harris, Hitchens, etc. ), particularly on Christopher Hitchens, author of the recent God Is Not Great: How Religion Poisons Everything; it's written by a Mr. Berkowitz, senior fellow at Stanford's Hoover Institution and teacher at George Mason University's School of Law. Berkowitz is acknowledging what he sees as some fundamental weaknesses and inconsistencies in the arguements of the 'new new atheism'. Most interesting about the article to me(considering similar topics are expounded pretty regularly) was simply the source. Usually you have to look at Christianity Today--who did point out this article in one of their own--to find such a topic broached, so reading about it in the WSJ was a nice switch. Let me preface all this by saying: OOTP was easily my least favorite Potter book. In fact it's one of the most frustrating stories that I have EVER read. It wasn't poorly done or a bad tale, it was just an accurate depiction of a worst-case-scenario that frustrated me to no end. The movie is a different story. Up until this weekend, when I finally managed to catch the latest Harry Potter flick, Harry Potter and the Order of the Phoenix, the third film, Prisoner of Azkaban was my favorite. Azkaban to me captured the growing darkness in the wizarding world(which is also well seen and evolving in the two films following it), and it just had a very smart story. To top it off, Azkaban introduced Sirius Black, easily my favorite character in the Potter-verse. All that to say, I believe that Order of the Phoenix surpassed its predecessor in only one viewing. OOTP the film manages to capture, in a little over two hours, the heart of the book(which is an intimidating 870 pages), and, for all the shaving of the story that had to be done with the time constraints, seems to lose all that made the book so hard to swallow. We're still presented with a worst-case-scenario: the wizarding community simply doesn't believe Harry and Professor Dumbledore's claims concerning the return of Lord Voldemort. This is a bad situation. Discredited by the media and doubted by his classmates, Harry feels dreadfully alone in his fifth year at Hogwarts, despite those friendships that he has and seems to be forgetting. The film renders all of this, well, beautifully. The story is not only powerful, but it's just well done. The cinematography is clever and different than in the previous films. The score is phenomenal, and allows one to forget John Williams's absense, unlike that in Goblet of Fire. Even the acting is well done, though several characters' scripts did not allow them the impact that they were capable of(Sirius, Lupin, and Snape, I think, but certainly Ron and Hermione). Imelda Staunton does a particularly fine job as Professor Umbridge, though as her name suggests, she is hardly a pleasant character. The movie is also full of pleasant sublties pointing towards year 6, that, while readers will recognize them for sure, the sharp viewer also may catch. The sublties of the book that are lost here, really, are the frustrating ones. This film also shows you why so little was really made of Harry and Cho in Goblet of Fire... again, I accredit this to the time constraints. Frankly, if the film were to be extended at all, I would give the extra minutes first to longer glimpses of the frequently-displayed newspapers and edicts in Hogwarts that the audience's eyes barely have time to scan. The brevity of these shots really proved to be my main gripe against the film, and, to quote Mars Attacks! "that ain't bad". If you're a stranger to the films(or the books), I certainly would not commend Harry Potter and the Order of the Phoenix to you, just because it is part 5 of 7. There is to much back-story to be understood to really jump in here and enjoy the ride. However, for (most)fans of the books, and anyone who's simply enjoying the films this should be a pleasure. Harry's story begins to follow an even darker path in year 5, but it's necessary and still a joy to travel with him. I strongly object to the tyrannic and unscriptural insolence of anything that calls itself a Church and makes teetotalism a condition of membership. Apart from the more serious objection (that Our Lord Himself turned water into wine and made wine the medium of the only rite He imposed on all His followers), it is so provincial (what I believe you people call "small town"). Now, I don't know that its being a "small town" idea really does to these fellows' arguement, but that's beside the point. The weight of Lewis's response to them lies in the word unscriptural. The Missouri Baptist Convention has recently moved that any church plant receiving funding from them must teach alcohol abstinence. This is a reaction to Theology at the Bottleworks, an outreach of the Journey church(who was funded by the MBC), where folks would essentially drink beer and discuss different topics. While Donald Miller would likely applaud such a concept, this Rasta-esque outreach doesn't do it for me. Beer and church may not be incongruent, but I don't see them as really congruent in this sense, especially given the divisive nature of the conflict over alcohol, and the serious conviction that many believers have against it. Drink your beers after the discussion, but alas, here we are. And here the MBC is. Church planters who receive money from the Missouri Baptist Convention (MBC) must now teach alcohol abstinence. This, under the banner "we need to engage the culture, but without compromising our biblical, traditional Baptist values." Baptist values, I'm afraid so. Biblical? No. Now, there certainly are Biblical restrictions on alcohol consumption. The warnings against drunkenness are plentiful(see Lk 21:34 and Gal 5:21, for example). Also, any Christian under the age of 21 in the United States simply cannot drink. To disregard the law of the land is not only unbiblical, but it only betrays a spirit of impatient selfishness that cannot be supported before God by any arguement. These warnings in scripture should be acknowledged with the utmost seriousness by the Body. Nevertheless, arguements for complete abstinence from alcohol are unfounded. As Lewis points out, the Eucharist itself involves alcohol, and we can't that little incident in Cana at the wedding feast, Christ's first miracle. . . .don’t underestimate the effect of rhetoric coming from the Religious Right;every statement they make, in word or deed, tends to convince the rest of us how wrong they and their creed are and vindicating the truth of Nietzsche statement in The Gay Science (Die fröhliche Wissenschaft, 1882) ‘The Christian desire to find the world ugly and bad has made the world ugly and bad’. The only results I can see coming from this sort of move are 1) the growing discontent of many with the SBC; 2) the further fragmentation caused by a convention cutting ties with more culturally liberal partners; and 3) the continued estrangement, unnecessarily, of those we are supposed to be reaching. . . all to uphold a principle that is "hard to argue" for anyways. And yet the really scary part is, this could be indicative of things to come. According to CT's article, there were "heated arguements" on the topic at the annual SBC meeting in June, followed by an affirmation of abstinence. The heated arguements give me hope, as there are apparently those against unfounded teachings that serve to further ostracize many outsiders. It did pass in the end, but I have a feeling that this topic will be revisited before long. One of my major disputes with the very foundations of the Southern Baptist church has been the lack of established authority, i.e., we have self-governing congregations and the Bible, without any real denomination-wide rule over the individual churches and without tradition or an authoritative standard by which to interpret the scripture. This turn of events, however, is one case where I am glad for the deficit; otherwise the SBC would likely impose this "tyrannic and unscriptural insolence" on us all. My hope now is that those of us who are indeed disturbed by such decisions will continue to argue heatedly, and pray for their leaders to exercise more Biblically sound judgement. With the fifth Harry Potter flick from Warner Brothers(Harry Potter and the Order of the Phoenix) hitting Wednesday, and, more significantly, the final book by J. K. Rowling, Harry Potter and the Deathly Hallows coming the following weekend, the boy wizard is about to remind the world just how popular he is. Now, I've blogged on Potter before, and for now at least I have nothing to add to the topic; nevertheless, I'm more than happy to commend to you this recent post on internetmonk.com addressing Harry Potter and Wicca. iMonk has also just posted an article concerning Harry Potter by Leif Rigney, a college English professor and believer. Enjoy the articles, and, heck, get out and enjoy these books and movies. There's a little time to play catch-up if you're behind on Potter, especially with the films, and I think the books are certainly worth the time if you're a fiction reader. And for anyone who's worried that I've lost the ability to blog about anything other than movies or the occasional book review, fear not, as your regularly scheduled blogging is set to return soon enough. I've just been in a review sort of mood lately, but I'm about ready to start thinking about things again. UPDATE: Check out Euangelion's short blog post on the film here. He notes a major theme of the film that--of course I see and remember it "now that you mention it"--I missed altogether in review. This will be a little different: part review, part response to a review. Christianity Today's Brandon Fibbs gave Transformers 1 and a half stars. I don't work with stars. If I did, it would get at least twice that many. Fibbs's main complaints have to do with "the film's singular inability to even begin to take itself seriously." He also complains a great deal of the disjunct between the strength of the source material(the 80s cartoon), as far as plot and characters, and what we see here. I think these are valid points, and need to be addressed in any real examination of the film. I also think that Mr. Fibbs is missing the point a little bit. One of the first lines that you'll see in the film's closing credits is "Based on the action figures by Hasbro Toys". This line speaks volumes, concerning the history of this material and the intent behind it all. The Transformers cartoon of the 1980s was, like many of its contemporaries(He-Man and G.I.JOE, most noteably), little more than a thirty-minute toy commercial. That is why the other two included the features at every episode's end exhorting the kids to 'respect their parents' or 'look both way before crossing the street', or whatever it was for that episode. These lessons were meant to be the redeeming quality for TV shows that, otherwise, did little more than make your child want to go to Toys'R'Us. As noble as the plots of these wonderful cartoons may seem to fans, they were only excuses to produce a show so that toys could be sold, and we can't turn a blind eye to this fact. When CT's review complains of both a lack of devotion to the source material and Michael Bay's 'laughing all the way to the bank', there is betrayed a degree of ignorance(or just innocence as a child watching these shows); these two things go hand in hand. Even Optimus Prime's "valiant sacrifice" of his own life in Transformers: The Movie(1986) was simply part of the systematic off-ing of all of the older characters to make way for new characters to correspond with the next year's wave of action figures. Hot Rod toys won't sell near as well with out Rodimus Prime, and there's no Rodimus Prime as long as Optimus is around. No, I think that Transformers captures the spirit of the show very well, i.e., the spirit of giant robots who can turn into cars. Of course, they also strive to out-perform the cartoon in some respects, as the other review mentions, "Bay and his team go to great lengths (and time) to make Transformers a human story first"; I for one greatly appreciate this. The film is pretty long(nearly 2 and a half hours), but with out the length, either the characterization of the humans would be dropped, or the actions sequences, and both options are unacceptable. Now the film is certainly not perfect. There are some little plot holes here and there, probably due to scenes dropped because of the aforementioned run-time. There are also some lines that go beyond 'having fun' into the realm of 'Jar Jar Binks-like', which certainly irks one such as myself. For the most part though, the movie is kept within the bounds of fun, light-hearted, yet gripping. There are a few other little things that I could complain about, like the visual portrayal of some of the characters(Bumblebee in particular... I mean really. His name is Bumblebee, not Camero! ), but these are only the rants of a nostalgic 20-something. So what really makes this film worth seeing? Several things. For fans, it's Peter Cullen's voicing Optimus Prime. His is the only voice for the part. It's also the fact that Jazz looks like Jazz. The lines taken for the cartoon and the movie. The sick feeling in your stomach when the dreaded thought occurs to you(because it has to for any Transformers fan) that these film producers really are morons and they're actually going to kill Optimus again. Whether they do so or not, I won't spoil here. For everyone else? The action sequences are some of the coolest things you'll ever see. Shia LaBeouf actually does just fine(giving me higher hopes for next year's Indiana Jones 4, in which he co-stars). The premise of giant robots that turn into cars and fight other giant robots. This is simply a cool movie, all around. Is it provocative? Does it bring up any serious issues to ponder? Nope. Would you like the plot summed up for you? 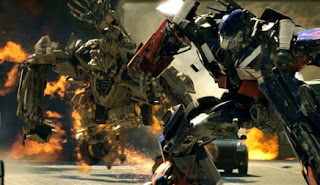 Let me sing it: Autobots wage their battle to destroy the evil forces of the Decepticons. That's what we're to expect, and that's what the film delivers. We get that in a package that includes humans who are a lot less annoying than Spike or Daniel. We get it in a form that is sufficiently updated to fit in the 21st century, yet not too far from its 80s roots. We get it with some of the most awesome effects you'll ever see. My conclusion: when you need to relax for two and a half hours, to take your mind of things, have a little fun--and it's not football season yet--go to the theater and enjoy. That's what Transformers delivers, and it's worth every cent of the over-priced movie tickets.